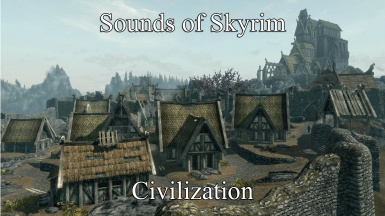 Adds 223 new sound effects that are played in Skyrim\'s cities, villages and small hamlets. Sounds include city activity (doors, children) , interior weather (thunderstorms) and tavern activity (shouts, crowd) and many more. Any sound file that is not listed below is free of use and without credits. Only sounds with an attributed author are listed below. Remember that if you want to use one of these sounds, you must credit the author. Addition: Added 7 new easter egg sounds related to goats that can be heard in Falkreath and on some farms. Quick notes: - Civilization is now bloat-free! The infamous bug that was introduced in version 1.0 has been fixed for good. Whew! If you still have a savegame that uses Civilization 1.0, refer to the Technical section below to know how to install the newest updates. There are more sound effects than what has been described above. Refer to the next sub-section to see the full list. 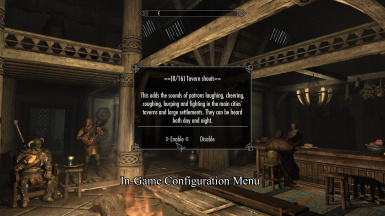 Some mods require a compatibility patch to work with Sounds of Skyrim – Civilization. You can find the patches on the mod’s download page. If you encounter a mod conflict that is not listed here, please let me know in the Forums tab. - Download/Update Skyrim Script Extender from SKSE's page. - Open the console and type ClearInvalidRegistrations. You will see a message telling how many reports it found and removed. You must give it some time to work though, so play the game for a few minutes and make a new save. - Install Sounds of Skyrim – Civilization as instructed above. No more bloat! -You will find instructions provided by community modder Arthmoor at this link. Note that you will need Notepad ++ and the knowledge of Papyrus to proceed. If you don’t, use Skyrim Script Extender instead. There's an in-game configuration utility that allows you to disable or re-enable groups of sounds.